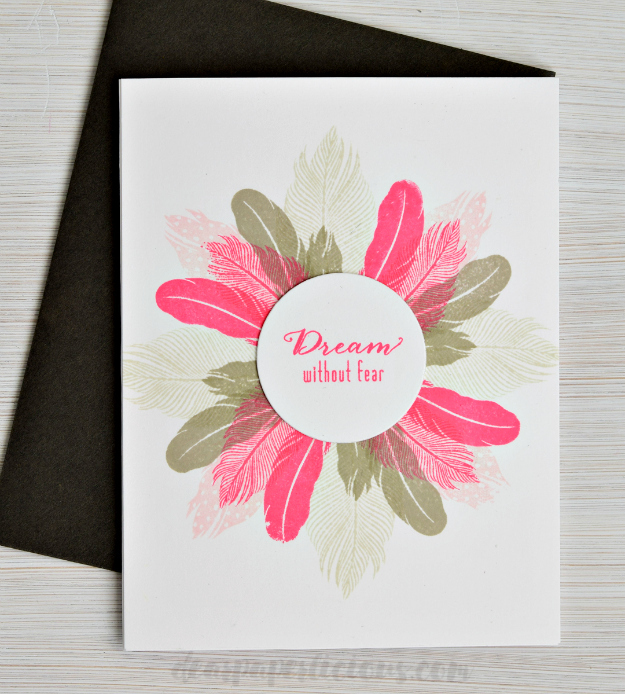 This card is going to an amazing woman who has been suffering from Stage 4 breast cancer for over four years. The cancer spread before her initial diagnosis. Yet, she continues to dream and hope and find joy in life. The feathers are from a beautiful Gina K Designs set called Fine Feathers, designed by Claire Brennan. The sentiment is from a no longer available Waltzingmouse set called Funky Feathers. Inks by Altenew. Used this Jennifer McGuire technique to make sure all the feathers were lined up perfectly. That woman is a genius... Adhered the top panel to an A2 card. What a fun design Joan,so playful!! I like the colors of your feathers. This is delightful!! Those feathers make a delightful "frame" for your sentiment, really awesome card, Joan! I've never seen feathers look more beautiful! A wonderful sentiment for your brave friend, too. She's taking the only approach one can really live with. Pinned! No, not us... your amazing card :) Plus made a note to check out that stamp set. I've been looking for a set of feathers. Certain your friend's spirits will be uplifted upon receipt.